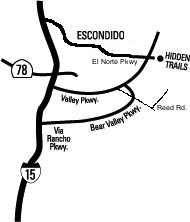 The community of Hidden Trails is nestled within an escape of shady avocado trees. This rural setting is defined by four villages tucked within the gently rolling hills of Escondido. Please enjoy this site and use it often. If you have friends or family who might be interested in any of the information you find submitted here, simply email the page to them!